Target specific locations for your demographic with eye-catching floor stickers and static cling vinyls for a cost-effective and high impact approach. Floor stickers are very effective for grabbing attention. 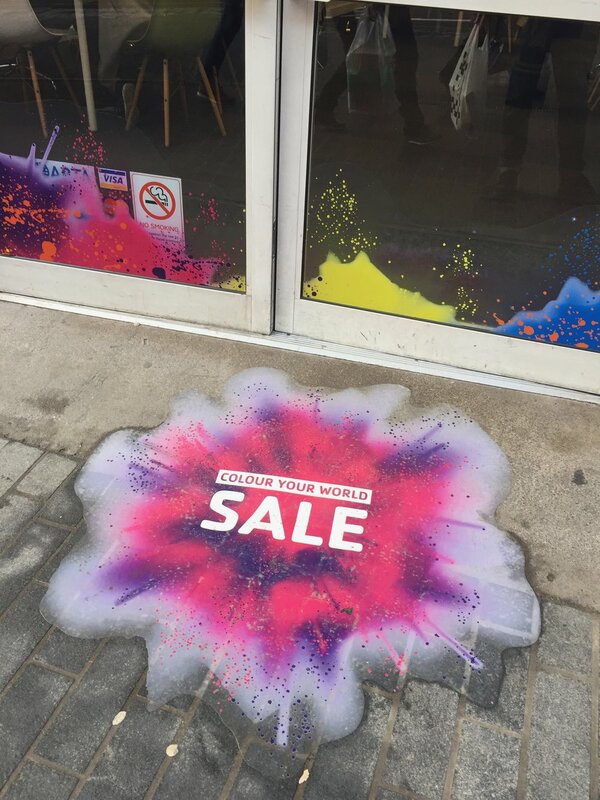 Independent market research shows that when a stickers were placed on the floor just outside the door of a shop in a shopping mall the number of people walking into the store increased by a whopping 25%! Re-positionable and re-usable, clear static vinyl clings are the perfect solution when you want temporary ads or signs that are transparent and see-through from both sides. They're easy to install; they simply cling to windows or glass through static. They can be removed and reused multiple times without leaving any sticky residue. Increase traffic to your shop by as much as 25%! Shown to be a highly effective marketing tool, these can be made any shape colour or size you need. Ours are scuff-free and anti slip, ideal for public places and they last about 3 months. They work on a number of surfaces and they don’t leave any sticky residue when it is time to remove them. Repositionable and reusable, clear static window clings are the perfect solution when you want temporary window signs. They can be placed in unconventional street locations such as phone boxes as they are easy to install; they simply cling to glass on portions where there is no print. They can be removed and reused multiple times without leaving any sticky residue. Floor stickers and static cling vinyls work brilliantly in combination for an even bigger impact. If you want more information on our outdoor floor stickers or static cling vinyls, please contact us.